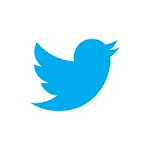 Warning.... this is probably the longest post I have ever written. It could be a small book! 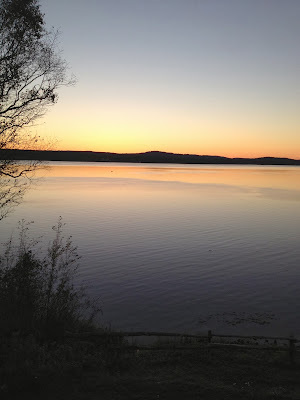 I hope you enjoy it as much as I enjoyed writing it. 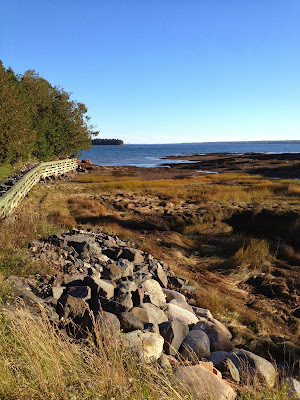 I am back from the KnitEast event at St. Andrews By-the-Sea, New Brunswick, Canada. 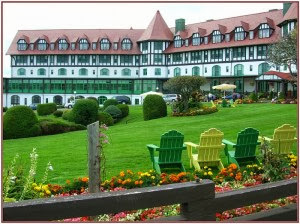 We stayed at the beautiful Algonquin resort. Most of the resort is under construction (which was supposed to be finished by the event date) but they opened a small section of newly renovated rooms for some of us to stay in for the weekend. The rooms were really lovely and the setting was completely charming. 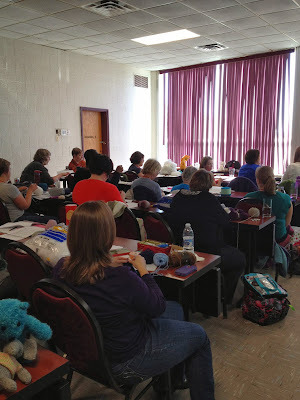 The event was great but the heart and soul of the weekend for me was the knitters. 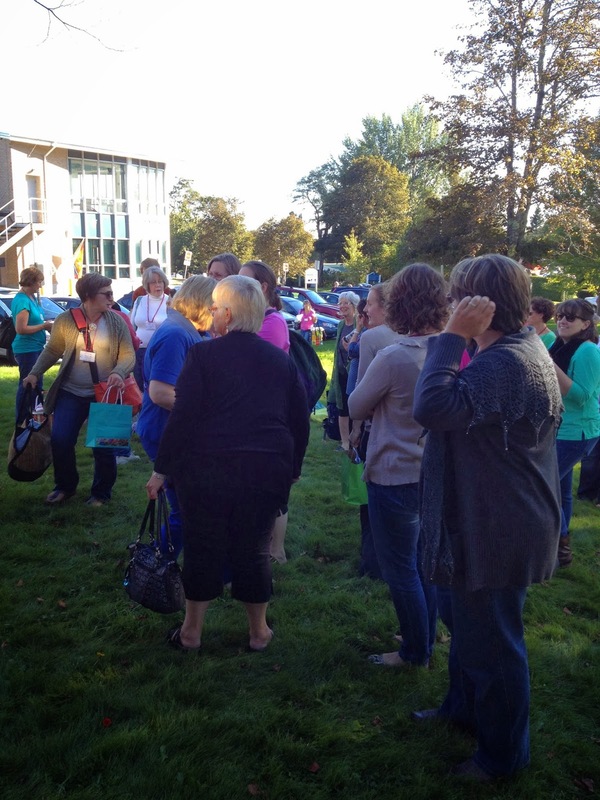 The knitters at the event were the warmest, most-welcoming group around. 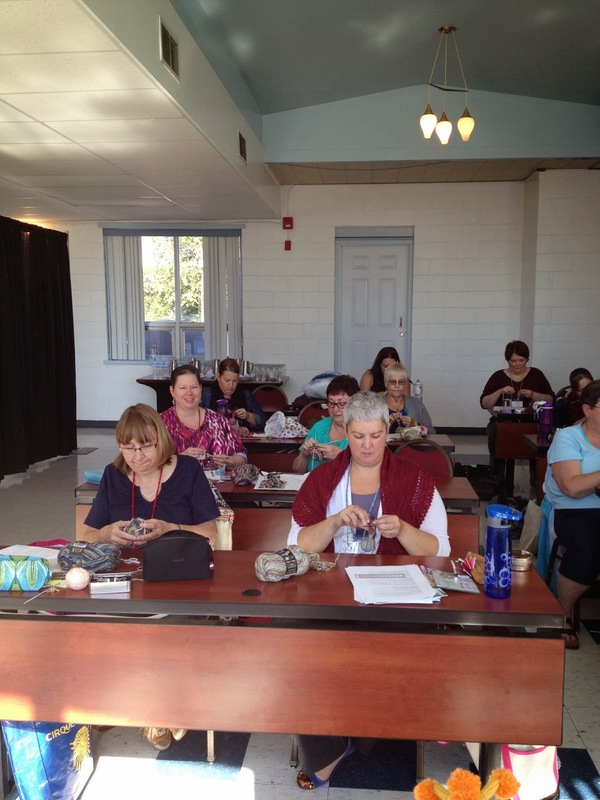 They were all talented knitters, friendly and helpful and kind. I received gifts, warm stories, and hugs. 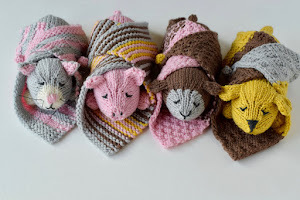 I was shown photos of children and grandchildren and their knit toys and hats from my designs, and many brought the actual toys they had knit from my patterns and books to share with me. I signed tons of books throughout the weekend. It was beyond wonderful. They were an all-around fun and funny bunch. I had so many laughs throughout the weekend. 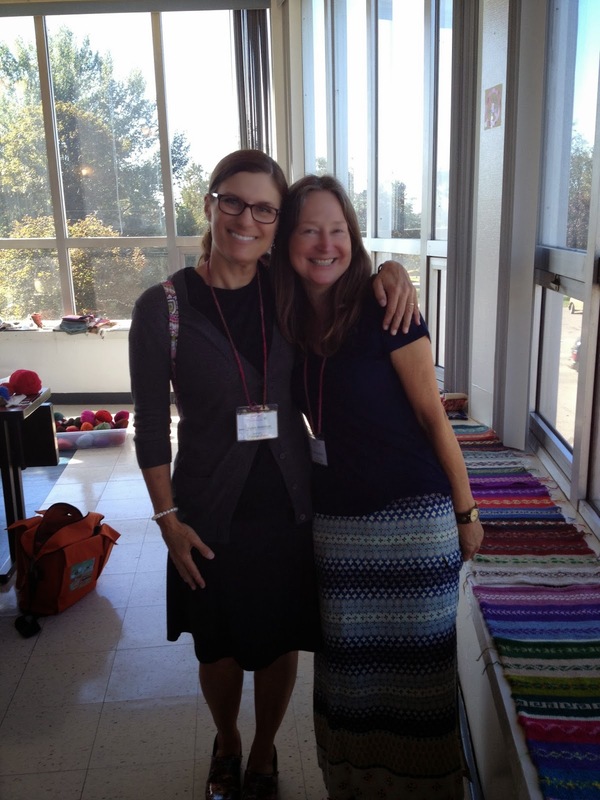 We knit many long hours together all weekend and laughed and learned along the way. It was good. I am so glad I had the opportunity to teach at KnitEast. 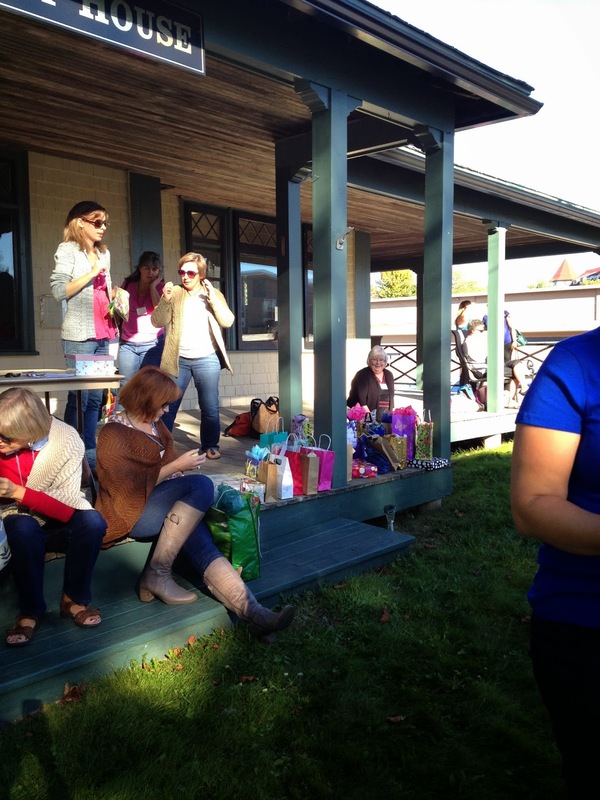 Thank you to Donna Walsh, the owner of the Cricket Cove yarns shops and the organizer of the event. I had a great time. It took 3 flights for me to get to St. John which was still well over an hour long drive to St. Andrews. I happened to see Ann Budd in Chicago and we were on the same flight to Montreal. That was nice. Ann and I went through customs together in Montreal but when I came out the other side Ann was nowhere to be seen. I looked back and she was being told she couldn't get through customs. She had some kind of strange boarding pass that wasn't exactly right and this became an issue. We still had another flight to get to St. John for the event. I went on to my flight without Ann, weaving through the Montreal airport which is huge and maze-like. There was no time to spare and I walked right onto the plane when I got to the gate. It was a small propeller style plane. I looked across the aisle and there sat Stephanie Pearl-McPhee. I have met Stephanie a few times before and so I caught her attention and told her about Ann's trouble at customs. We both literally sat and stared out the plane windows just waiting for Ann to appear. The plane door was closed and off we went. Stephanie popped her head up over the seat back to look at me with the saddest face I've ever seen (that part made me laugh, not at Ann's situation but because her face was just so funny and summed it all up perfectly). We both felt so terrible for Ann. It turns out the next flight to St. John was 6 hours later. It would get her to St. Andrews after 1am in the morning. It was going to be a very long night for Ann Budd. When we arrived at the airport in St. John there was a limo waiting for us at baggage claim. Stephanie grabbed her bag quickly. My two suitcases, however, did not show up. Unbeknownst to me, I was supposed to pick them up at baggage and bring them through customs with me in Montreal. I had no idea I was supposed to do this, thus no bags for me. In these suitcases were my clean clothes for one, the other more important bag had all of my teaching supplies, materials, demos, samples.... everything. This was not a good thing. I lost both Ann and my luggage on this last leg of the trip. At this point I have to pause to tell you a little something. We all know Stephanie Pearl-McPhee. 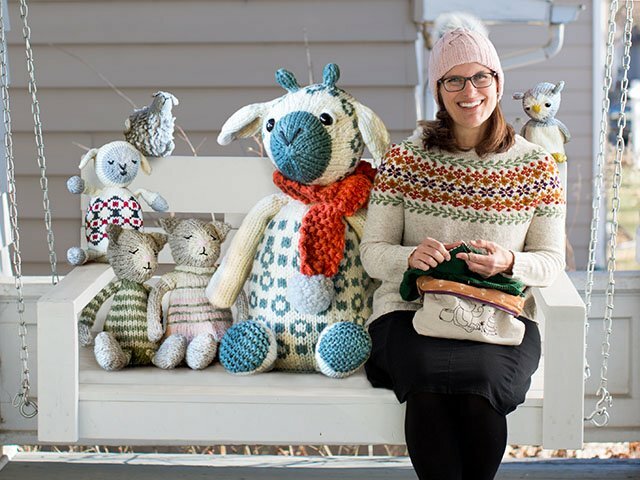 She is undoubtedly one of the most well-known and beloved people in the knitting universe, if not THE most well-known and beloved knitter of all time. She is a big deal. Many (thousands and thousands and thousands) of us have been to her events, talks, and classes and of course we are followers of her amazing and famous blog and books and charities (she has raised hundreds of thousands of dollars for charities). You all may have a wonderful perception of Stephanie, one that is glowing and positive. Let me tell you, however great, talented, kind, giving, caring, funny and fun you think she is, she is actually a million times better than that in person. No lie, she is THE. BEST. Stephanie at this point in the trip took me under her Canadian wing for the rest of the weekend. She was the best and most welcoming host and friend anyone could ever hope for. Stephanie led me around, took care of me, took me out for meals, made me laugh harder than I can remember recently, told me great stories and facts about Canada and Canadians. Stephanie made this event and trip for me in ways that I can't explain. I was so awkward and bumbling this trip, for reasons unknown, I could not for the life of me get things to go my way. With the flash of her smile she easily made everything funny and fun and okay. Stephanie was simply fantastic. I have always loved and admired her but the reasons why I love and admire her became crystal clear this past weekend. And this made me love her even more. 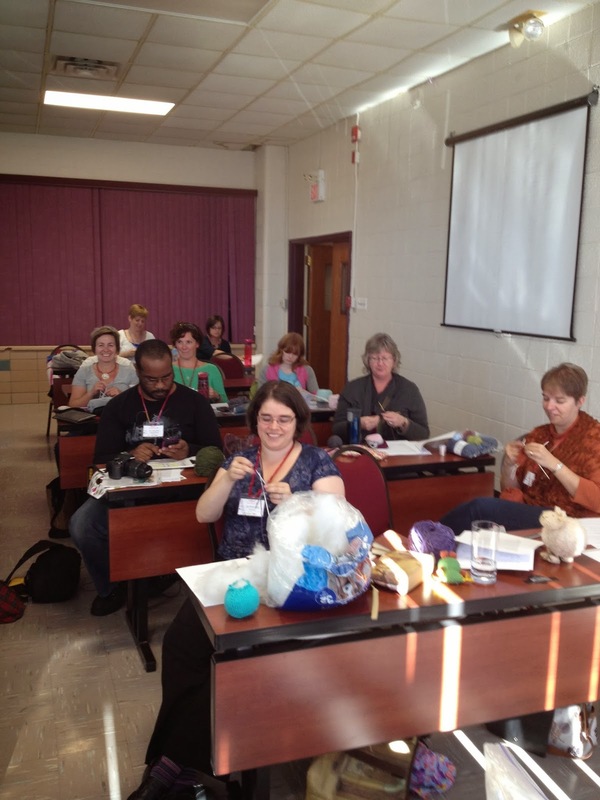 Stephanie had taught at KnitEast before so she knew the lay of the land. 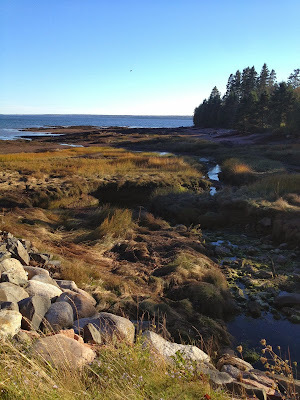 We hiked it into town the night of our arrival and ate a yummy dinner (I had Atlantic salmon) and then we went to a tiny grocery store to stock up with as much as we could carry with us back to the hotel. 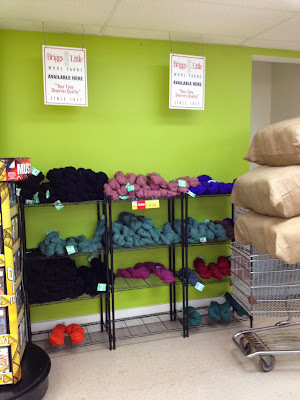 I could tell we weren't in the states any longer by the wool for sale in the grocery store. In fact, if you think there isn't much on the shelves just look at those brown sacks stacked up on the grocery cart on the right. Those sacks are filled with more Canadian wool, all by the local company Briggs & Little. It's good wool, too, not the shabby stuff. Not only was the wool fun to see at the grocery but it was on sale for only $3.29 a hank! What a steal. Now back to the bags, the Algonquin staff was helpful and kind beyond belief. The bellhop even wore a kilt and throughout the weekend the bellhop was always a friendly, nice-looking young man. The staff helped me, along with my husband who called and called the airport baggage claim person urging and begging them to deliver the bag in the morning, not the afternoon as they had planned. 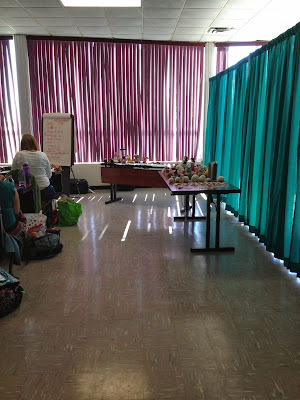 About half-way through my first class, the bellhop in the kilt (or skirt as Ann Budd called it much to Stephanie's chagrin ~ Ann was teasing) showed up with both of my bags and delivered them right to my classroom! This would never happen here in the U.S. What relief I felt. 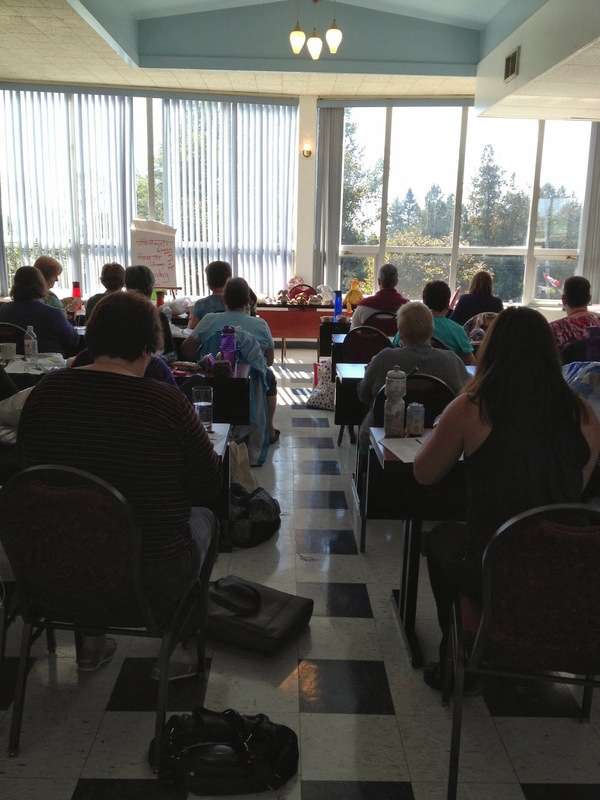 This first class I taught was extremely understanding. I had shipped my handouts ahead so we just dug into those right away and got started. 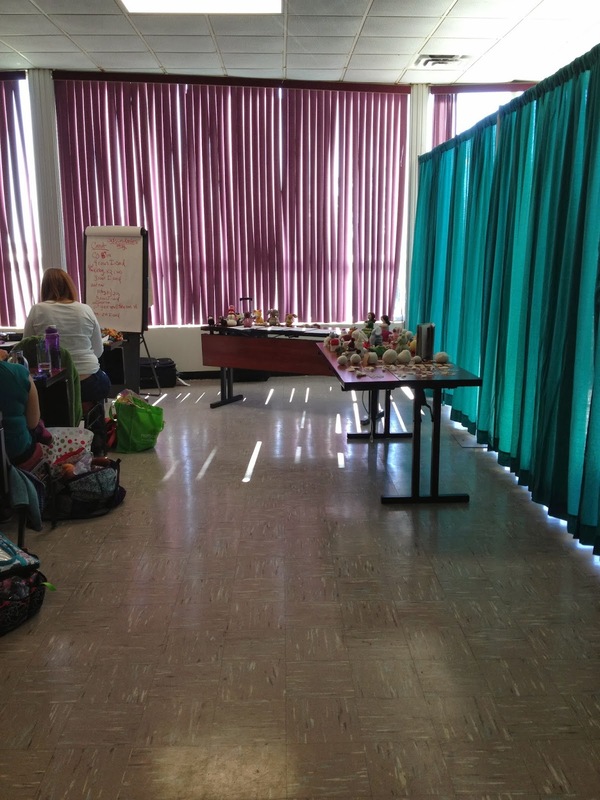 The students let me use all of their tools and materials for demos and instruction during the class. They were fun and happy to be there and we had a great time together. I was too flustered to remember to take photos of the first class. However, I had many students who spent the entire day with me so they were in the next class, too. I even had some who spent the entire weekend with me. I LOVED this, we just picked up where we left off from the previous class and went on from there. It was great fun. My second class had a fresh new me - in clean clothes even! I changed at lunch and it felt sooooo good. 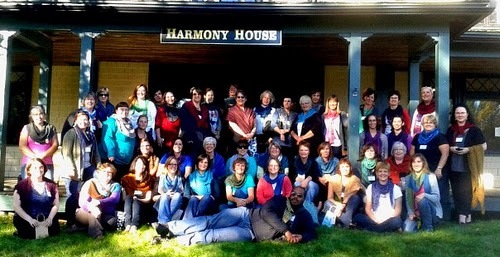 In this photo I see Lea and her sister Linne up front and Lea's husband Sterling in the second row. 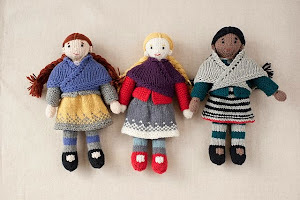 I already feel as if I know them because they are members of my Itty-Bitty Knits group on Ravelry. It was great to see them in class. 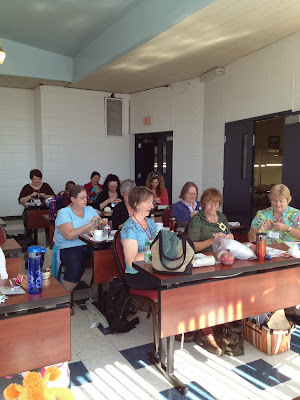 On the other side of the room I had more Itty-Bitty Knits group members, Leanne, Laura, Shelley and Melissa. Having IBKers (as we call ourselves) around me for the weekend made everything brighter. 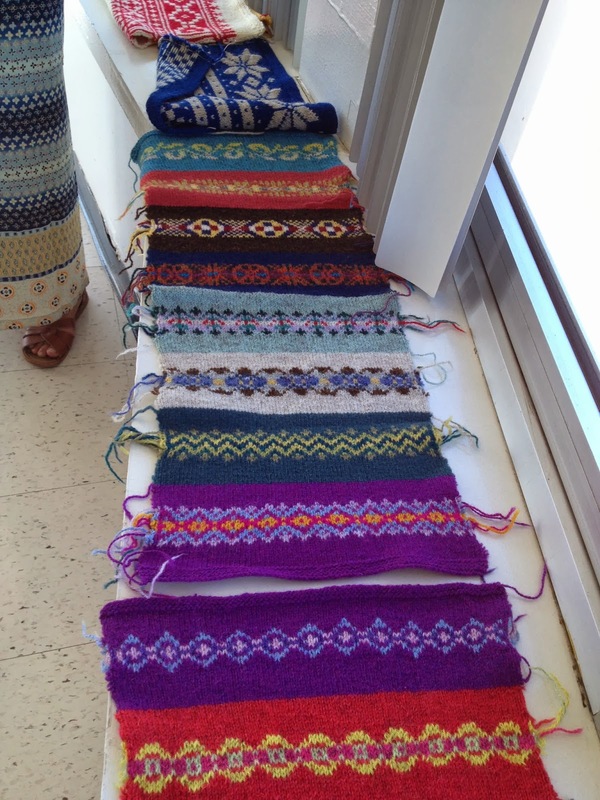 The Itty-Bitty Knits group members are a close-knit bunch, meeting up in person together all over the globe. Really. My classes were enormous and full. I loved every minute of the teaching at this event. Every class went very well and we had a good time together. 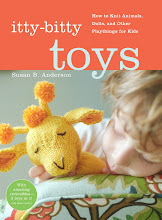 I set up my trunk show for Topsy-Turvy Inside Out Knit Toys on a separate table. This is always a fun trunk show because the toys are so playful and interactive. I love to see the students playing with all of the toys and laughing while turning them inside out! There's nothing better. Small group demonstration time for class #2, Build-a-Toy! 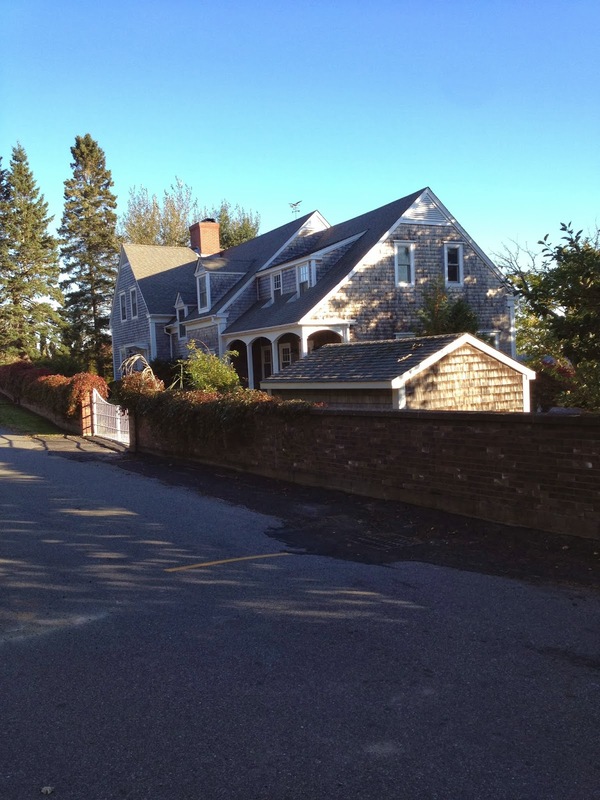 Back to the Ann Budd storyline, she did get to the hotel in the wee hours of the morning before class. I am sure she only had a couple of hours of sleep after getting up at 3am the day before. She had to be exhausted. You never would have known it, she looked fresh and ready to go that first morning of class. She is a real pro. I gave her a sympathetic hug at breakfast and off we went. 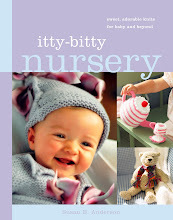 I first met Ann Budd (click here to see her 10 knitting books ~ I own and use them all constantly! I bet you own them, too. If not, go get them all!) at the Loopy Ewe's Spring Fling 2013. 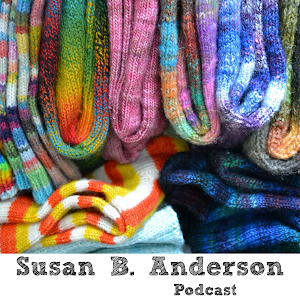 Ann Budd is another of the most well-known and beloved knitters of our time. 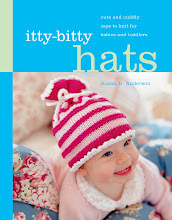 Her knitting handbooks are first of all genius but second of all are probably the most referred to books of all time. I really think she is greatness, one of a kind, in the knitting world. I am a true devotee of Ann's work. KnitEast had quite the line-up of teachers. I couldn't believe I was included. When I met Ann at the Spring Fling I was instantly struck by her down-to-earth personality, her friendliness and her sense of humor. Ann is a funny one and a humble one. She is not afraid to laugh at herself and this is so endearing and charming. I discovered that Ann and I actually have quite a bit in common as we have gotten to know each other a bit. There are two main things we really had in common on this particular trip. We both, during our travels, had developed horrible blisters on our feet. Horrible. 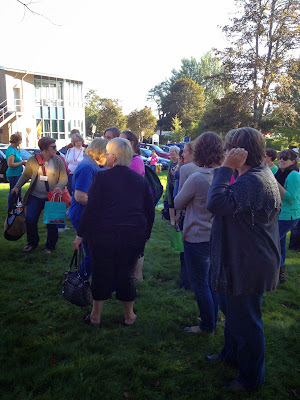 All weekend we exchanged and sought out band-aids just so we could walk to and from the teaching venue. It was bad. When the flight left without her in Montreal it crossed my mind that she was going to give me band-aids for my blisters and now she was gone. We laughed the next day because she brought up the band-aids she was going to give me when we got separated. We were suffering with our blisters. Her blisters were worse than mine I think. The other thing we have in common besides blisters is that we both have a terrible sense of direction. All of my life I have struggled with my sense of direction or lack thereof. It is a constant battle for me. As we were traveling together I found that Ann and I might be about of equal skill in this area. Don't ask either of us how to get anywhere, you'll never arrive. Both Ann and I are the youngest of four kids in our families and we think this may have something to do with our being directionally challenged. We were dragged around by older siblings during our formative years and therefore never had to find places on our own. This makes for trouble in adult-hood when you are expected to know where you are going. Guess what sibling order Stephanie is? Yes, you got it, the oldest, and we were glad for that fact. She took care of both of us like the older sister should (only she is the youngest of the three of us). After the classes on Saturday I quickly hurried down to the Shawl Swap! 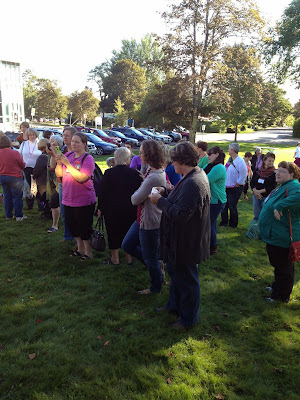 On the KnitEast Ravelry group a gigantic shawl swap was organized. I love stuff like this so I immediately joined in. I can't remember how many joined the swap but I think it was close to 100 or so. 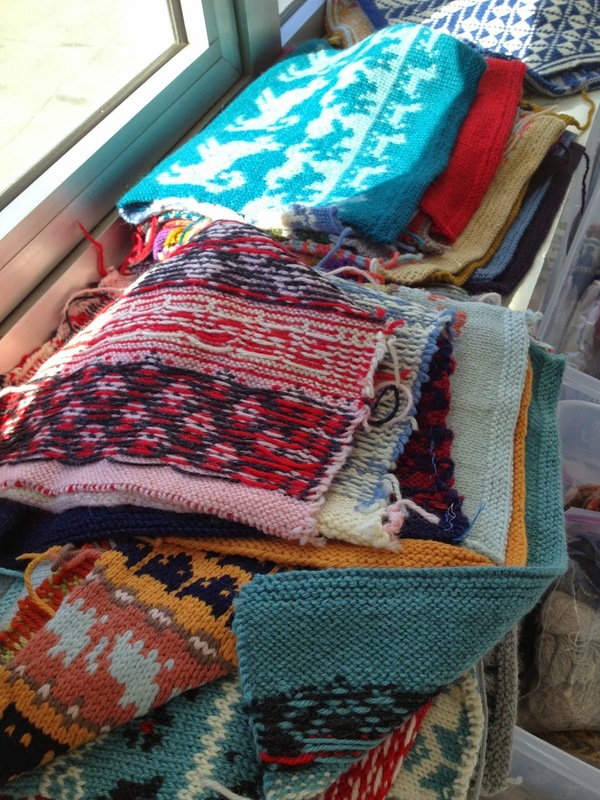 See all of those cute bags filled with handknit shawls on the step? Those were called off one at a time and presented to the receivers. It was really fun! 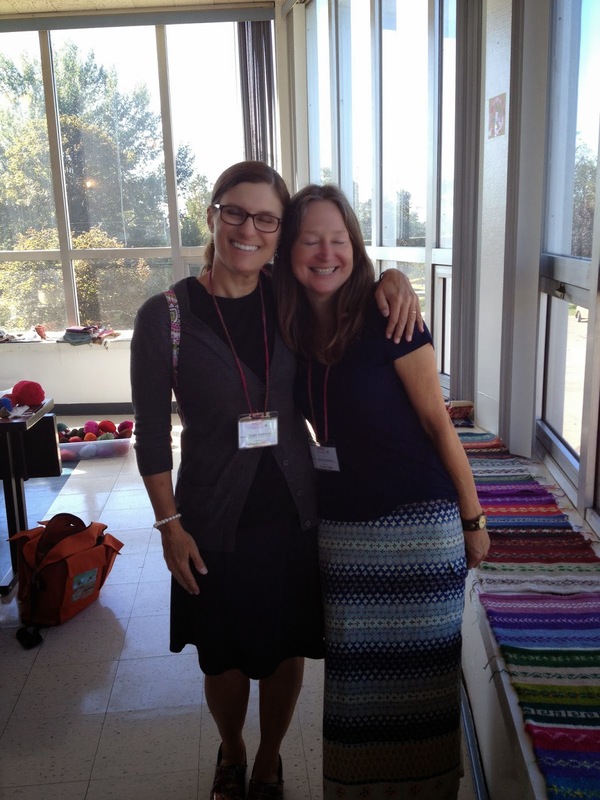 This is my partner, lindahebb (rav id)! I spun the 100% superwash merino wool in a traditional three-ply and knit it into a Prairie Ridge Shawl (my newest pattern). It was about a sport weight. I added a sweet lacy edging. It is a good size shawl and I love how it turned out. Linda loved it!! She wore it all night at the fashion show and then I saw her the next day and she was still wearing the shawl I knit for her. That made me feel really good. Linda's daughter happened to be in my all-day class the next day which was fun as well. Vicki knit me a shawl for the swap. It doesn't show up very well in the photo but it is a gorgeous chocolately brown tonal lacy shawl, knit in 100% Ontario alpaca. It is as soft as butter and it is a nice size, perfect. I love it so much and it will keep me warm all winter. Thank you, Vicki! 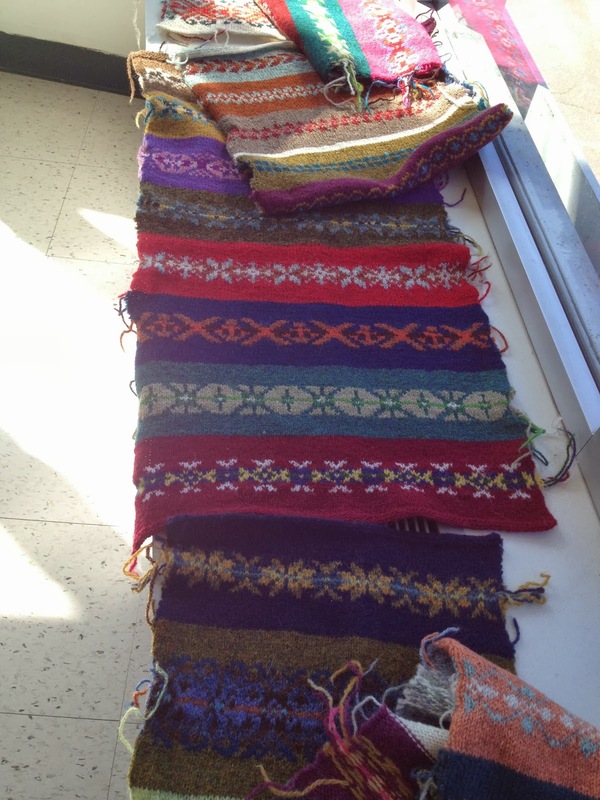 Here's the entire group of shawl swappers in their shawls! Can you see me in there? 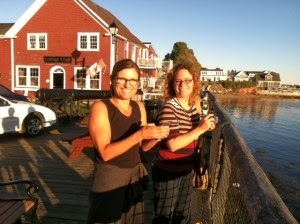 On Saturday night I had the pleasure of going out for dinner with some of my Itty-Bitty Knitters. I took a few scenery shots on the way. What a gorgeous setting for a retreat. I can't imagine a better place for knitting and walking to and from things. It was the best. 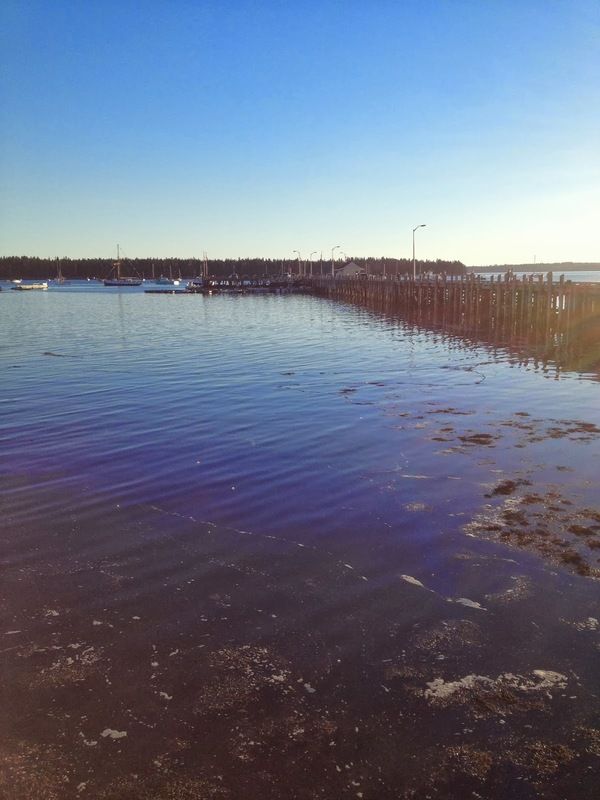 On the right is an enormous dock. The tides come and go to extremes here leaving boats on dry land and then back up on the water all in a day. Stephanie (left) and Ann Budd shooting the scenery. My buddies for the trip! How lucky I felt. 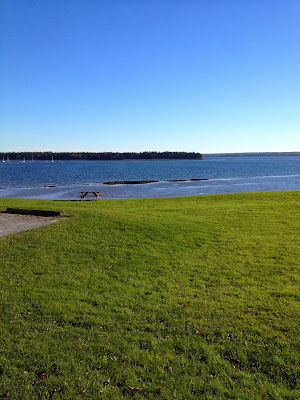 Here we are enjoying the beautiful setting and unseasonably warm weather. 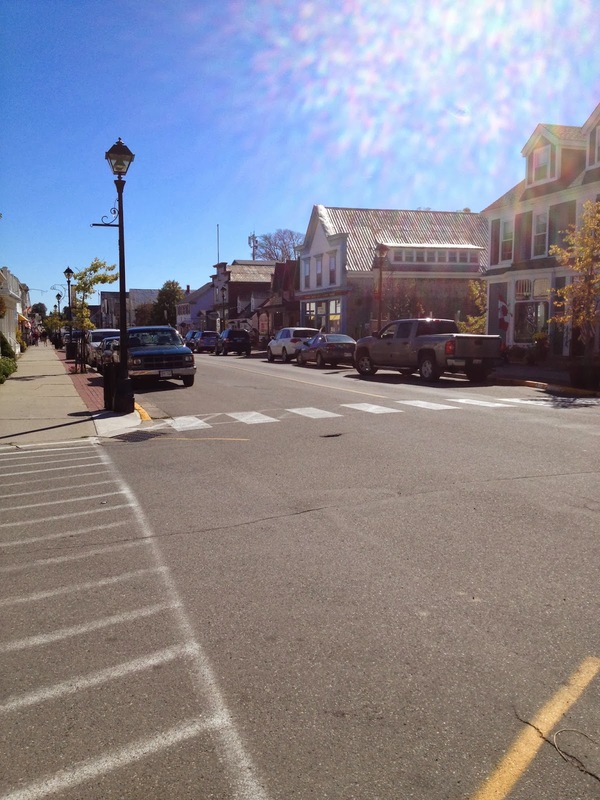 Do you see how charming the main street is? 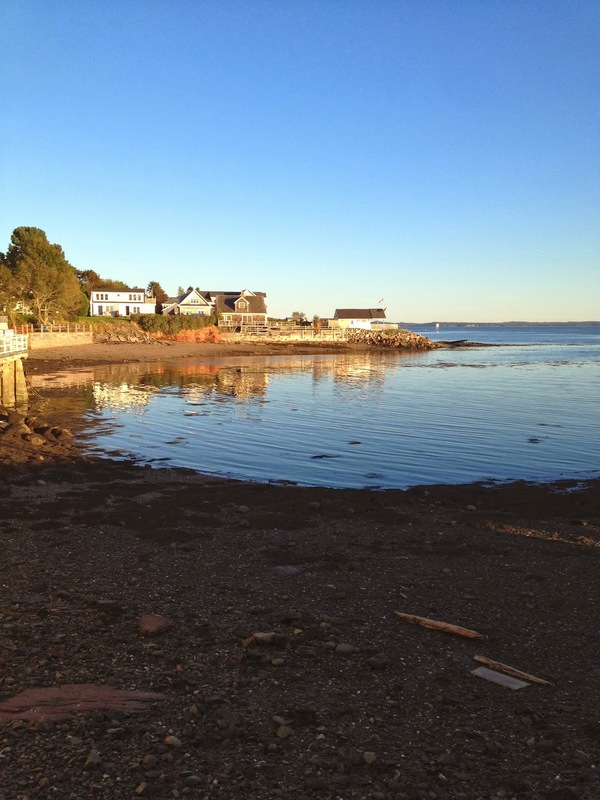 It's all along the coast filled with old houses and buildings. I loved it. 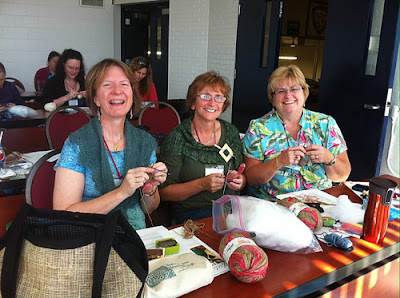 Here are four of the teachers for KnitEast 2013, left to right, Deb Barnhill (I loved meeting Deb! She is Canadian and wonderful!!! 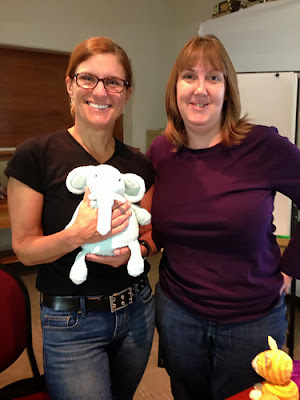 ), me, Ann Budd, and Stephanie Pearl-McPhee. 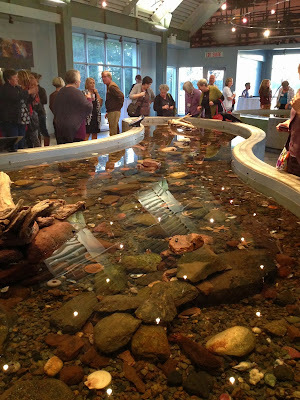 After dinner we went to a local aquarium for the KnitEast fashion show and reception. This is Shelley (TeensyToes ~ rav id). She is excited to be expecting her third child and KnitEast was her first time being away from her other two kids at home. I was utterly charmed by Shelley. She took two of my classes on Saturday. She is so bright and funny and just plain good-natured and fun. I fell in love with her over the weekend. What a good woman. 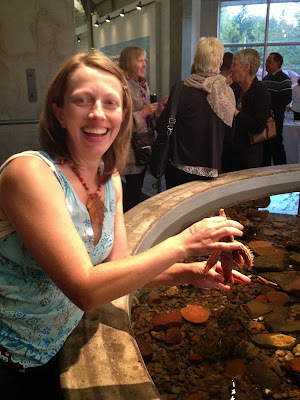 Shelley was also daring enough to pick up a live starfish in the touching ponds at the aquariums. I have never seen anything like these touching ponds. 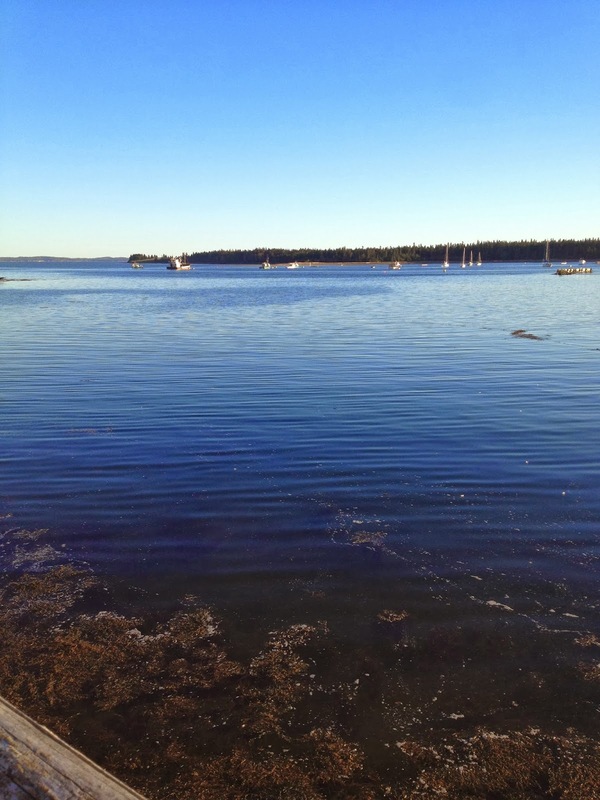 There were clams, fish, sea cucumbers, urchins, winter skates, etc..... all swimming around for you to watch, touch and pick up if you liked. Shelley was the only one I saw reaching in and picking things up and everyone got a kick out of her. There were two of these ponds. They were fascinating. Before the show, Leanne (Lunatic84 ~ rav id) and I headed out to the balcony to soak in the view. Leanne is a good friend I know from the Itty-Bitty Knits group. We are both lovers of our mutual friend Suzanne (knittingknirvana ~ rav id). We had a nice time raving about Suzanne together. Leanne is from the area and was another great comfort and guide and host for me during the weekend. She really helped me out and made my time so much fun. I was glad we got to spend some time together. Leanne was in both of my Saturday classes, too. Here Leanne is modeling her show stopper of a cardigan. 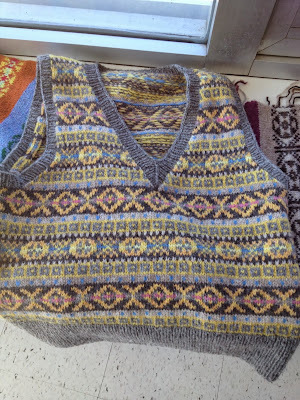 The pattern is Sylvi and it is knit in the Canadian wool, Briggs & Little Atlantic. Leanne left off the hood and made it shorter. I love both of her choices here and the color is perfect for her. She looks stunning and received comments all weekend on her gorgeous cardigan. I had a great time at dinner and at the fashion show with Melissa (mkdpage ~ rav id), Laura (laurago ~ rav id), Shelley (TeensyToesNB), and Leanne (Lunatic84 ~ rav id). Thanks for keeping me company, ladies! Just in case you could not possibly think things could be any better.... they got better. One of my most favorite knitting authors and designers and all-around cool person was teaching right next to me all day on Sunday (our rooms were divided by a curtain). It's the one and only Mary Jane Mucklestone! Okay, just look at her. She is gorgeous, cool as a cucumber, AND talented. I had heard her say she was bringing hundreds of swatches from her Fair Isle books (I own all of them and use them A LOT! Click here to find out more!) 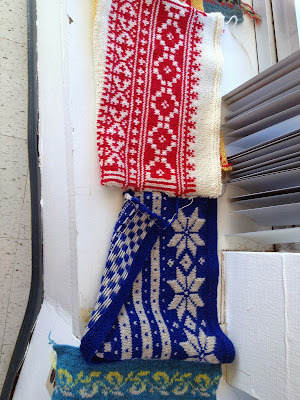 I couldn't wait to see these colorwork swatches all together. I am such an admirer of Mary Jane's work and have been for many years. I made her Fair Isle sweater from an old Interweave Knits years ago. Ever since then I have followed her designs. 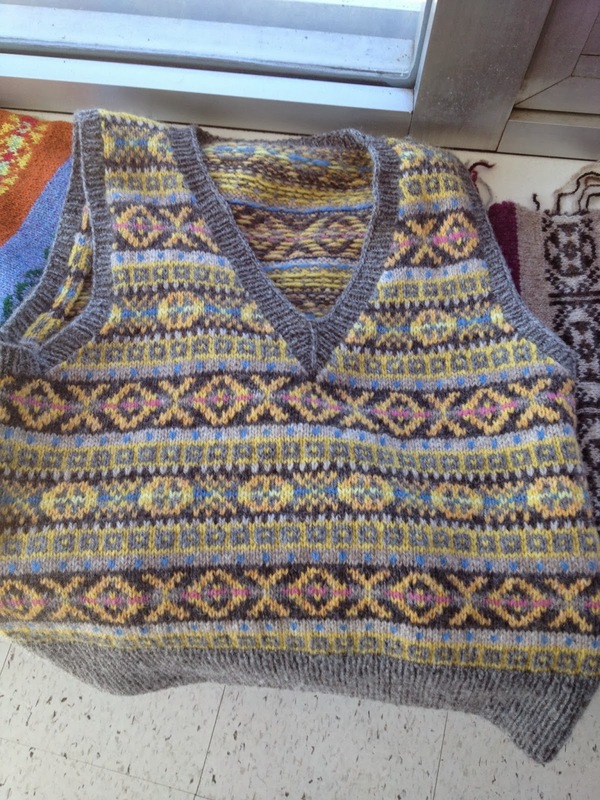 She also has a Fair Isle vest class on Craftsy and I have the Jamieson kit to make that vest. Very soon I will cast on for this one, I am so inspired by her work. I will be reviewing two of Mary Jane's books (both are new!) very soon on the blog. Stay tuned for that. 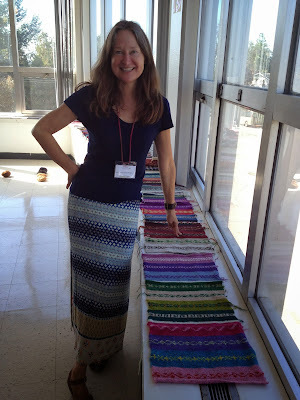 I met Mary Jane very briefly in between classes at Vogue Knitting Live in Seattle last spring. I think she is simply adorable. Her personality is bright and cheerful. She is smart as a whip. Her teaching style is informative and caring. I would love to take any and all of her classes some day. I just love everything she does in her knitting career. I believe she is also the stylist for the Berroco yarn company which is really cool. 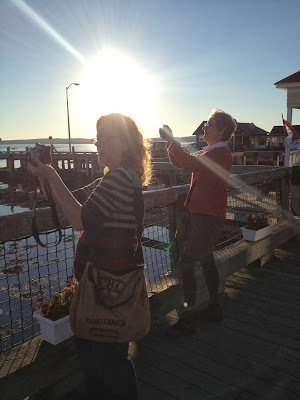 What I loved about this photo and moment is that when Mary Jane's nice friend and travel companion, Vicki, took our photo together, Mary Jane sort of snuggled into me. I loved that she did this. I found Mary Jane completely sweet and endearing. She is warm and friendly. I tried to kind of soak in the moment. I won't forget it. I threw this photo in because I love how we both closed our eyes in this shot. I was trying to soak in Mary Jane's awesomeness through our touching heads and I believe Mary Jane was trying to send me some of her good vibes at the same time. Can't you just see how sweet and snuggly she is? Ackkkk. She is so good. I love her skirt, too. 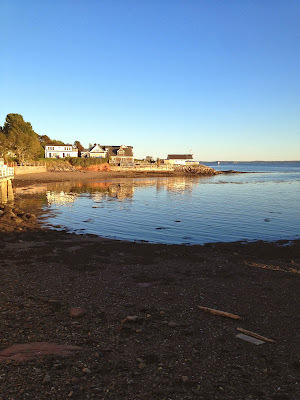 She is an outdoorsy sort like me and I love following her on Instagram ~ you should, too. Here is the Craftsy class vest I am making! Can you believe all of those? There were even more! I also got to meet the lovely Bristol Ivy (another instructor) and she was sweet and her students just loved her. I heard great things about Bristol all weekend. The oceanfront side of the main street was beautiful.... the weather was spectacular all weekend! Me still in my travel clothes from the day before with duffysmum (rav id) in my first class. This is her knit elephant from my pattern in an older Knit Simple Holiday issue, maybe 2008 or 2009. It was adorable and well-loved. Always good to see. Laurago (rav id) was fun and friendly! I had so much fun with her. I'm sorry to say I am blanking on names but the wonderful woman on the left is from Colorado. 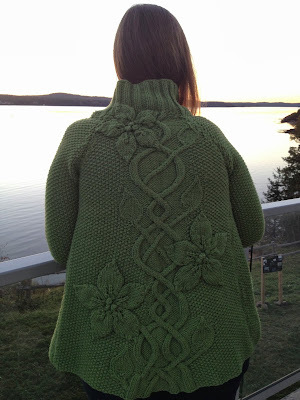 I met her in my Fair Isle hat class at the Loopy Ewe last spring. She is so much fun! Edited to add: It's Sarah on the left! I remembered as soon as she left a comment. Sarah also reminded me that as I tried to close the enormous blinds in our classroom I actually pulled one of the huge blinds off the track. It came tumbling down. The entire class burst out laughing and so did I! Add it to my list of awkwardness in Canada! I also forgot to add that all weekend Stephanie kept saying to me, "Canada's hard," in a sympathetic way. Edited to add: Two more awkward things I did that I forgot to mention: I couldn't get my seatbelt off in the limo. The button had twisted to the inside and I couldn't find it. Stephanie had to help me with my seatbelt like I was a child. (It's so bad, I know!) The other thing is that I couldn't get in my room at the hotel because I couldn't find the slot to insert the room key card. Stephanie had to come back and show me that you just had to hold the key up to the door and it automatically opened. Ridiculous on my part. Mary Jane and Ann Budd didn't know about the key swipe either so that made me feel a little better. Wanda (wmclean ~ rav id) is in the middle, she is a IBKer, and the woman on the right (I believe she is an IBKer, too) was the big Opal Sock Yarn winner in a contest for 10 balls of yarn and needles from the night before. 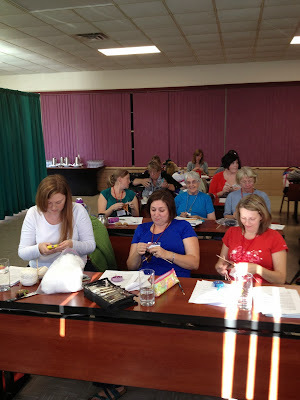 This group spent Sunday with me knitting Opal Sock Yarn Bunnies! It was a great group of students. 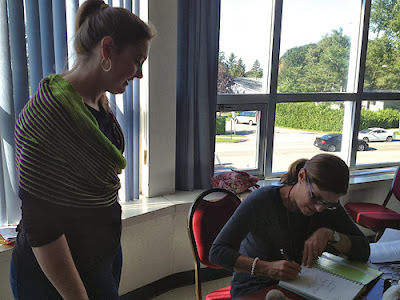 Leanne popped in on Sunday so I could sign her books before she left. Isn't she cute? She is the same height as my older daughter, almost 6 feet tall. I love her height. 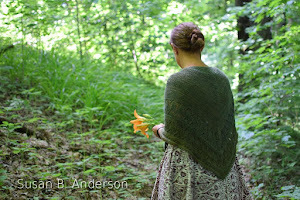 She is wearing her Color Affection shawl like a working shawl, wrapped around the front and tied in the back. 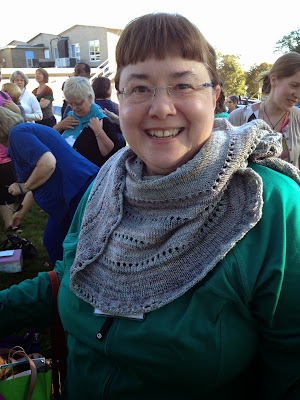 Now I have to knit this shawl and the Sylvi due to Leanne's inspiration. She is a talented and fast knitter. Canada is doing something right with their knitters. The overall groups I had were fast and smart and knowledgeable knitters as a whole. I was highly impressed. Here I am signing Leanne's books before she left to drive home. I loved all of the French speaking students and how lovely their French accents were when they spoke English. What a beautiful language. The classrooms were big and bright. It was wonderful. 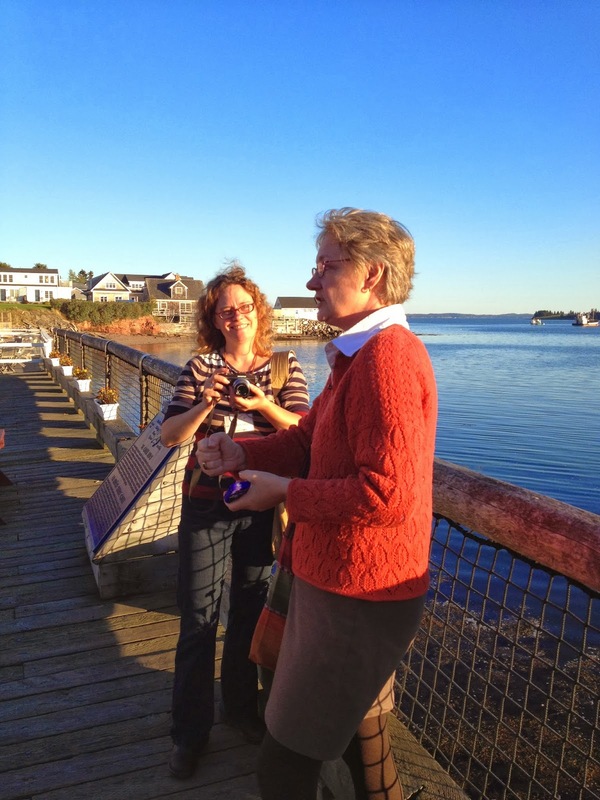 On Sunday I saw Ann Budd at lunch where she told me she had a mix-up with her morning class. The tale of mishaps continues.... Neither of us had working clocks in our rooms. Ann had to use her cell phone to find out what time it was. Her phone, for some reason, didn't register the time zone for St. Andrews (a time zone that doesn't even exist in the U.S.). She thought it was an hour earlier and missed the start of her morning class until someone called to see where she was. Ann is always punctual and early for things so this was not a good feeling for her. Her students were understanding and kind to her, of course, but she felt terrible about being late to class. Her woes still continued... more later on that. The houses were as if from a fairytale. I want to live here! This is the view from my final dinner with Stephanie and Ann on Sunday night. 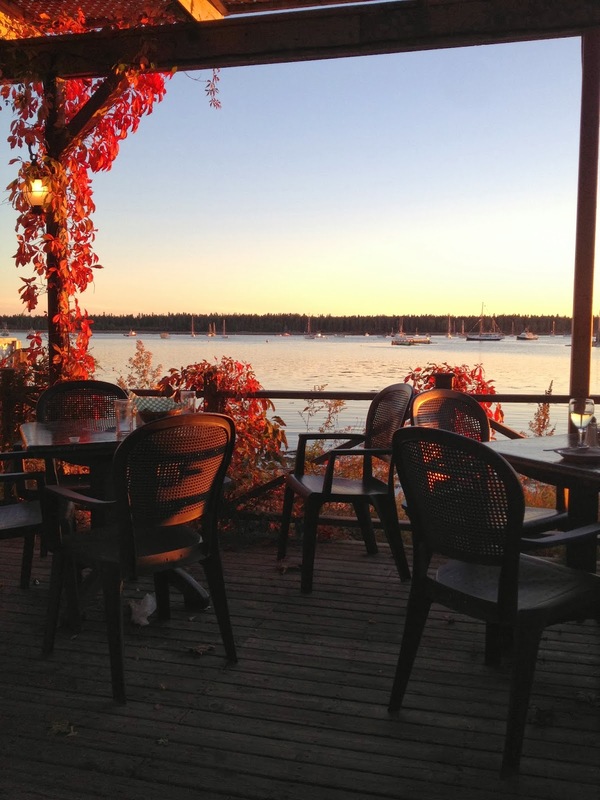 We watched the sunset from an outdoor patio while eating a delicious meal together. We laughed through the entire dinner. It was so much fun. 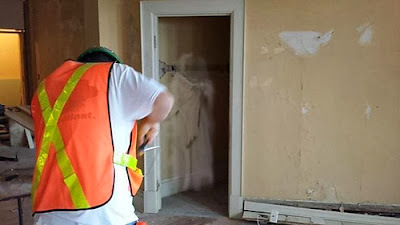 Do you see the bride ghost in the doorway? This happened on the Friday, Sept. 27th, 2013! When we got back to the hotel after dinner Stephanie asked the staff behind the desk if they had the photo to show us. Within one second they all had their phones extended out to us with this photo. They were so excited about the ghost photo. Do you believe this or not? The jury is still out for me but it added a fun element to this trip that was filled with the highest of highs and the lowest of traveling lows. To finish up the Ann Budd story, the three of us, Steph, Ann and I flew together to Montreal on Monday morning and then went our separate ways. Ann and I made it through customs fine. My flights were all on time and went smoothly. When I returned Ann Budd had emailed me that her flight from O'Hare to Denver had no record of her having a ticket at all for that flight. It was as if she had vanished off the list..... ghost bride, maybe? She got on a later flight and made it home fine. She just added it to the strange happenings list from the weekend. Anyway, if you have hung in here to the end, thank you! It was a trip of a lifetime. 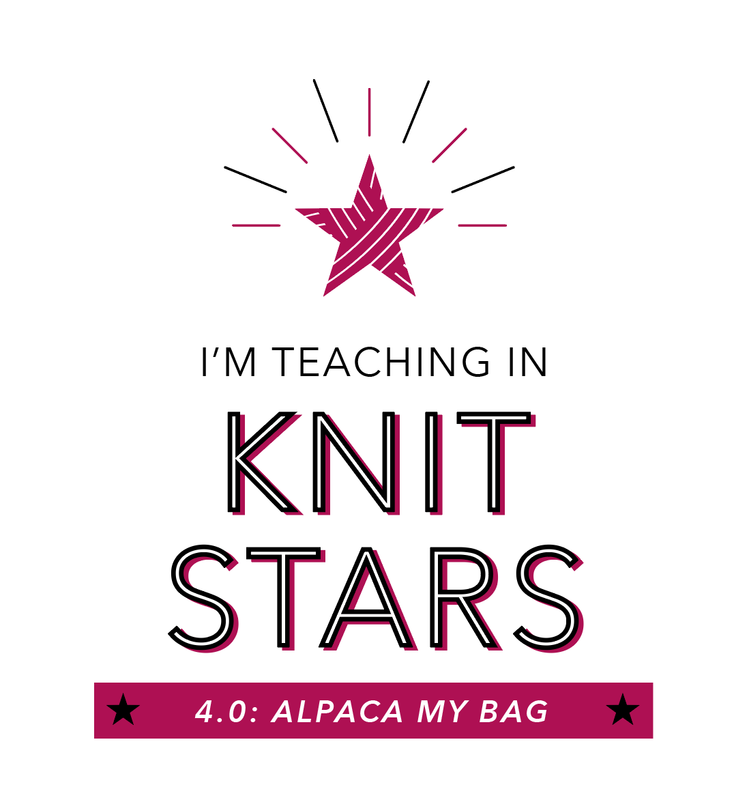 I'll be back soon with more knitting adventures. You had an eventful weekend, to be sure! 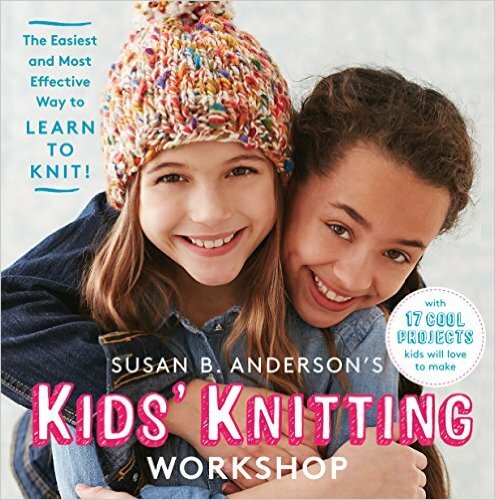 It looks like a fabulous event and I'm thinking it might be one more to add to my (ever-growing) wish-list of knitting trips. Haven't met Ann Budd yet, but do so admire and use her books. Mary Jane is just one of my very favorites - so cute and personable! Glad you had a good time! Why blisters???? I can't stop thinking about you and Ann's blisters? What a good write up of the weekend, Susan! It was utterly grand. I'm the one (well, counting Ann Budd -- as one always should -- the Other One) from Colorado. And the big Opal winner is Abbysgram (Rav ID). She and Wanda were such good seatmates in your Sock Bunny Class. I notice you wrote not a thing about the window blinds in Sunday's classroom. Tee hee! Thanks so much for the bunny class. Now to figure just how quickly I can knit the full sized ones ... there are daughters & nieces galore and Christmas is not that far away. Take care of those blisters! AWESOME POST !!!!! I was at knit east too. I am so glad you enjoyed your first trip to Canada. 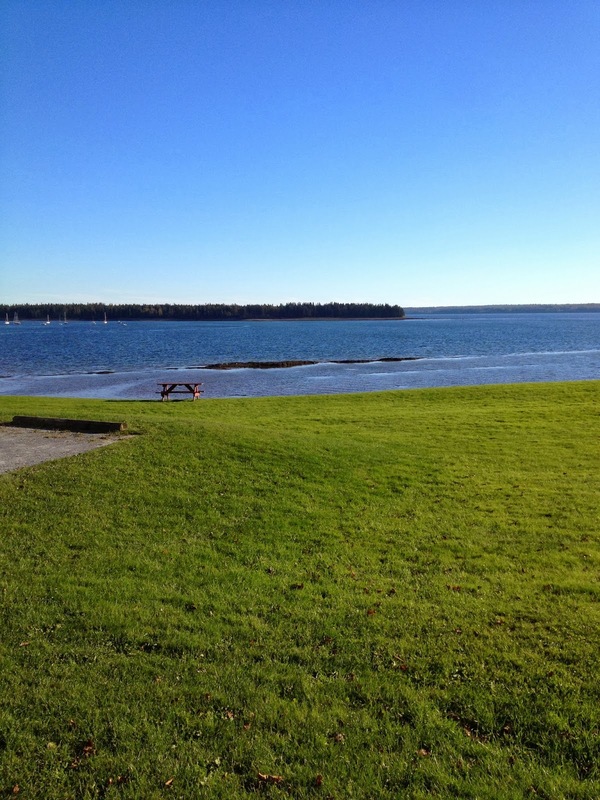 I am from Fredericton just a short drive from St. Andrews and had soooo much fun going down for the day. 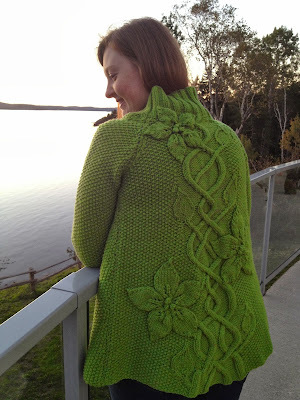 It was my first fibre festival EVER and now I am hooked. 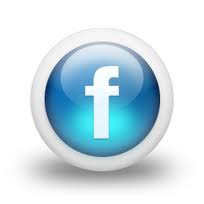 Thank for the great post loved it all. I made it to the end! 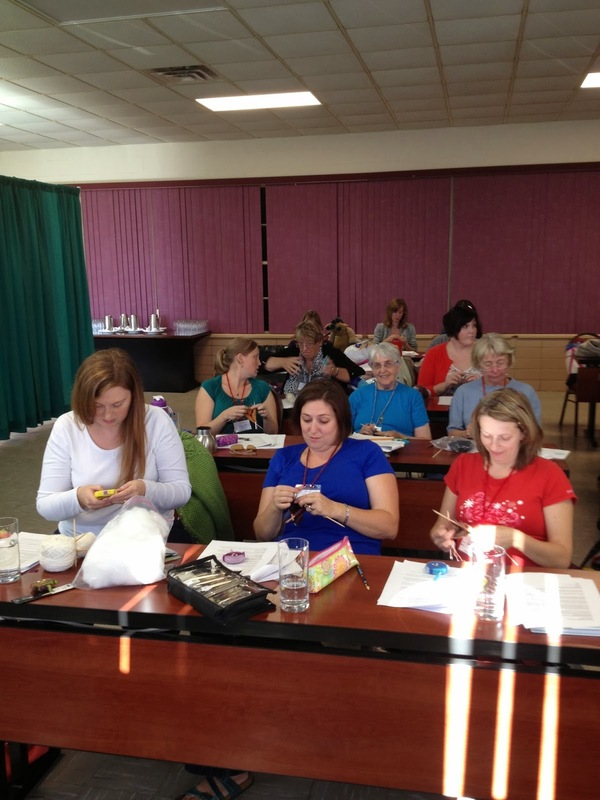 Sounds like a fabulous retreat with lots of fabulous knitters. Thanks for sharing. I made it to the end and laughed out loud a few times! You write as I imagine you would talk. I hope someday to have the pleasure to meet you in person. 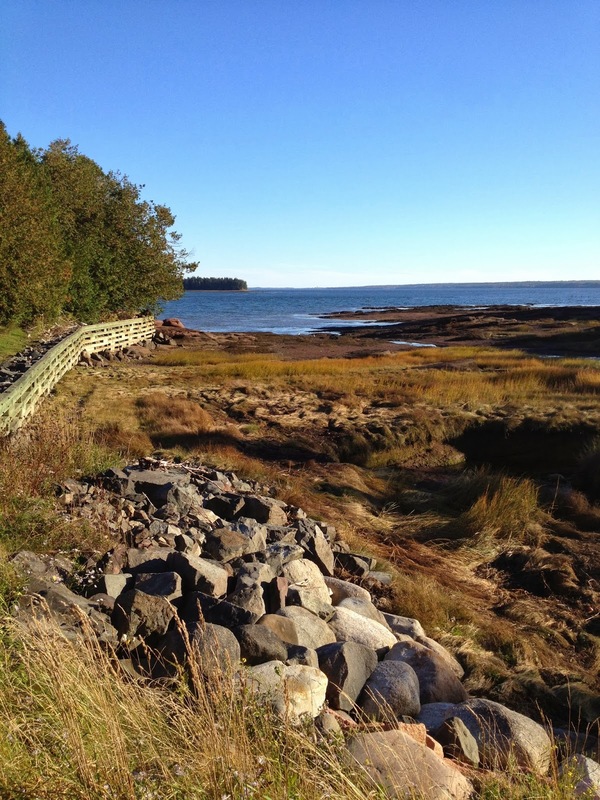 Your trip sounded amazing and Montreal is one of the many beautiful parts of Canada! Thanks for sharing your adventure! What a gorgeous setting and what tales to tell from this trip. What an experience. Great post Susan! 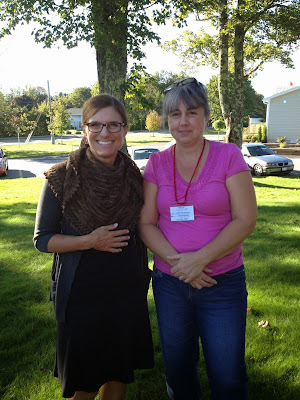 It was wonderful to meet you in person even though I would have loved to have the time to take a class with you. I can only hope that this will happen next time...Knit East 2015 maybe?? I am so happy you had a good time in "my" country (even if where you were is far away from where I am! )I'm also equally disappointed that I couldn't be there! Do you think you will return next year? Maybe I can plan ahead.. thanks so much for sharing all the glorious details. and I LOVE the ghost story. glad you had so much fun, eh? Had I known that the weather had turned out so well, I might have attended. 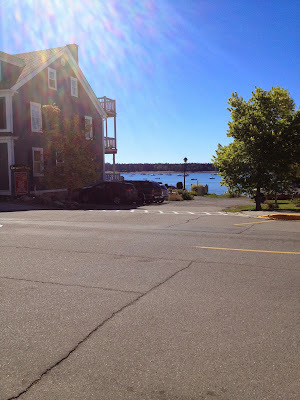 - My sister lives in Fredericton and had been here in Ottawa the week before. I could have gotten a drive over in time for the Event! 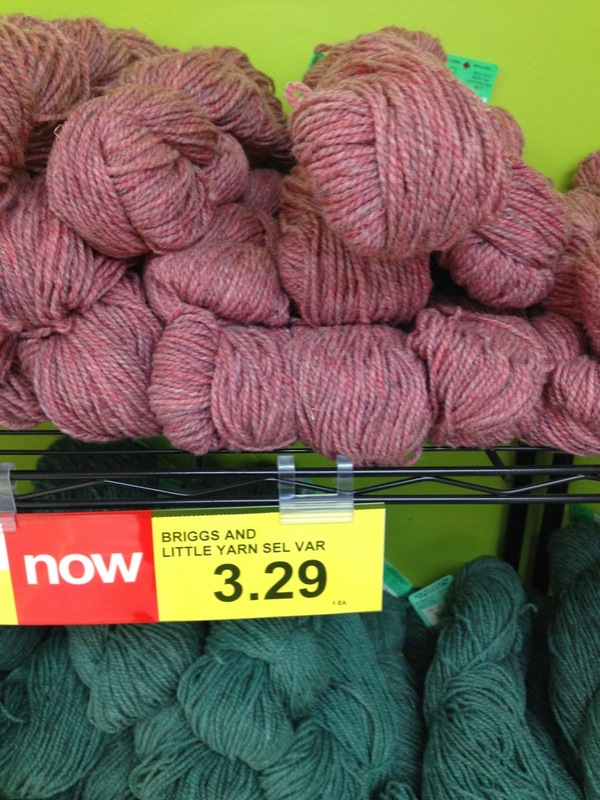 So, yarn at the local Grocers, huh? SWEET! 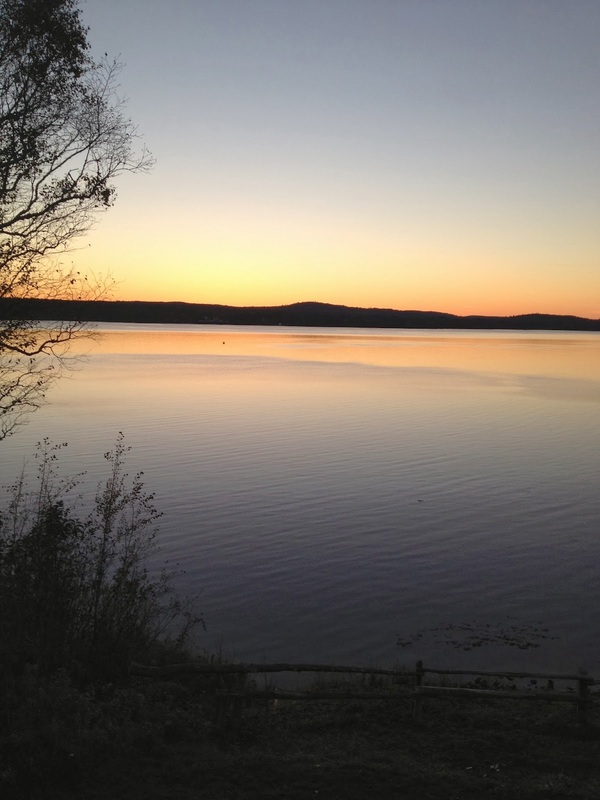 -- Doubtful that you'd find that anywhere else. Whatever, thanks for the heads-up! The next time Sis is around those parts, I'll have to have her pick some up for me! Thank you for such a complete post. I enjoyed it and like others have said, will add it to my ever growing list. 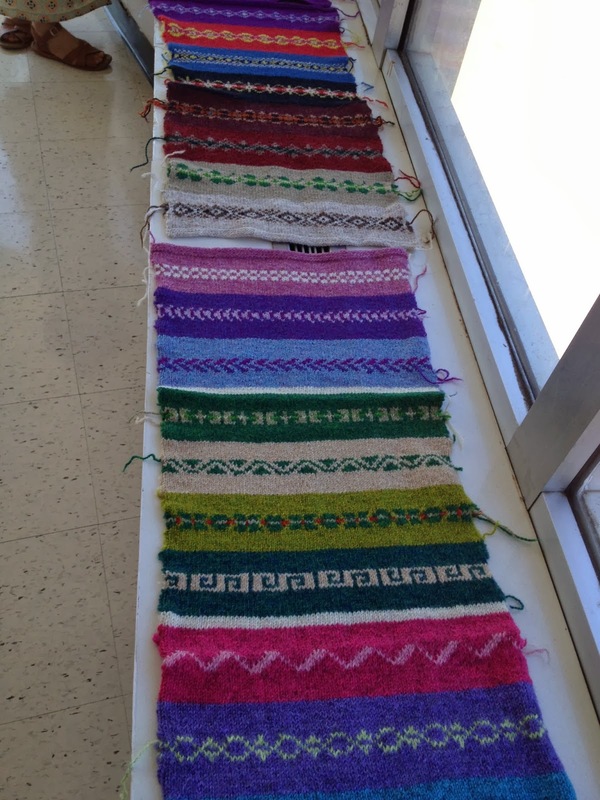 What talented knitters! I am also truly impressed that you went for a run with blisters!! You are dedicated to all that you do; your family, your knitting and your running. Go Susan! Hi Susan! 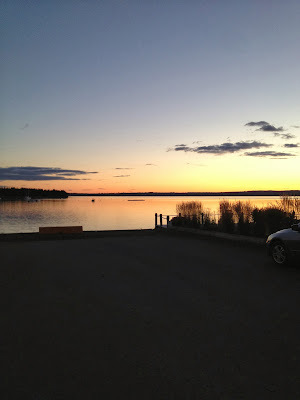 What a great post, it helped me relive the weekend once again (which I've been doing all week!). 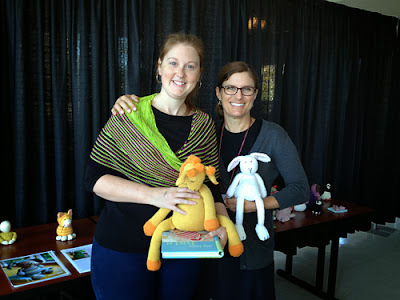 I had such an amazing time at the whole event, and getting to meet you (and your toys!) was so awesome. I learned so much from your classes, your teaching skills are right up there with your knitting and designing ones! Thanks for a great experience. What a fun adventure and what a beautiful place! 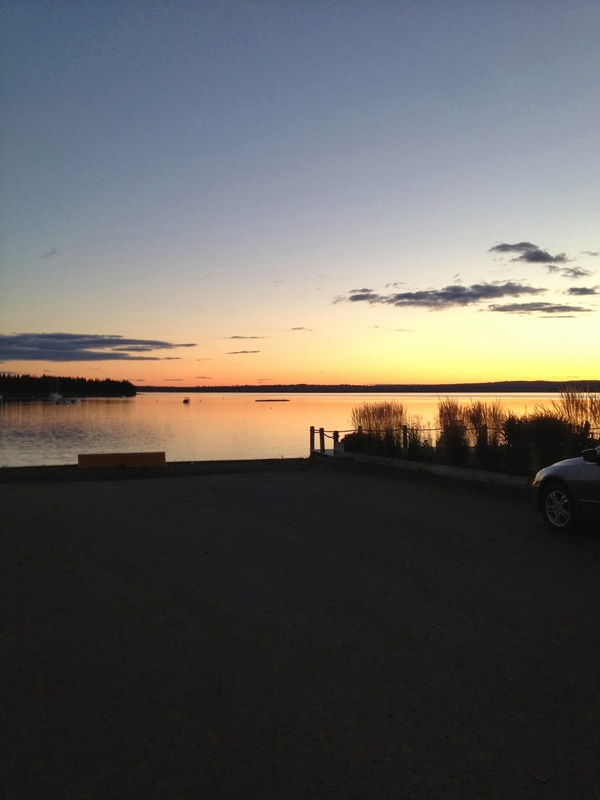 Thanks for sharing---it makes me wish I had been there! What a wonderful weekend, I'm sure a fantastic time was had by all. Even with the mishaps and blisters it seems to have been a trip filled with many wonderful memories. I have 2 of your books and also 2 of Ann's. 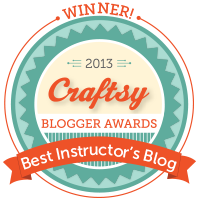 I have your class on Craftsy just haven't taken it as yet. 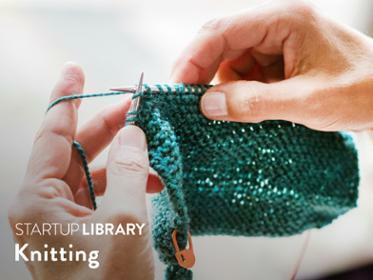 Would love to have the opportunity to attend such a gathering, but am afraid I need to learn to knit a bit faster and have more skills before I do so. Thank you so very much for sharing. Brings smiles to our hearts to hear of such wonderful times together! Thanks for taking the time to write this, it was interesting and entertaining! It is so lovely to see your upbeat attitude and flexibility in the face of unexpected bumps. I loved your story Susan. I am a Canadian in Ontario but we stayed at the Algonquin many years ago with our girls. So glad you enjoyed our great white north ( even though it wasn't white yet ) thankfully! We are a friendly bunch in Canada and many of us love your work. Come visit us in Ontario anytime. Wow, I feel kind of famous right now! I had such a great time with you last weekend. I'm so glad I was able to be a bit of a 'rock' for you in your crazy busy weekend. Thank you for the sweater love!!! 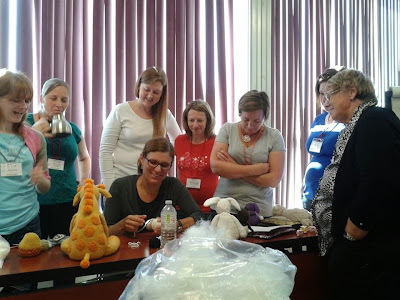 Thank you so much for teaching at KnitEast Susan. So happy you enjoyed our little corner of Canada. Everyone loved your classes ..... and you. 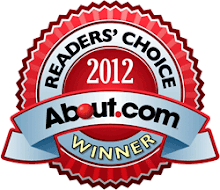 I have been hearing positive comments all week! I know losing your luggage with all of your precious toys was stressful but hopefully having it delivered right to your classroom by a guy in a skirt helped make up for it...and yes, you can move here - just say the word and I'll start working on your visa! Your constant smile and inspiration made KnitEast 2013 special. What an awesome post! Thank you! 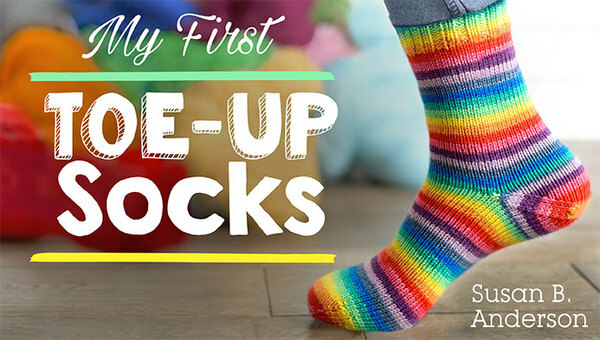 I have read some of Stephanie's books, I have Ann Budd's sock book thanks to your recommendation awhile back and to learn more about them was wonderful. If it wasn't for all of you I would've given up on knitting a long time ago! LOL! I felt like I was there with you and I never get out so it was wonderful! 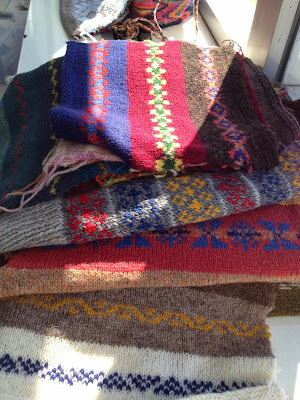 I'll be looking up MJ Mucklestone too since Fair Isle is something I would love to attempt someday. 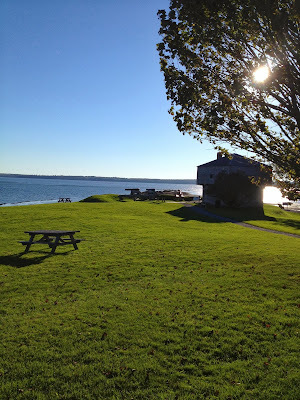 Wonderful, wonderful post and what a beautiful place on earth! So glad you had a good time. Sounds like I missed out on a fun retreat!!! Susan, what a brilliant post! I love your writing style. I found myself laughing and then getting a little teary eyed too. I'm sure your students loved your classes, as always. Thank you for sharing with us.